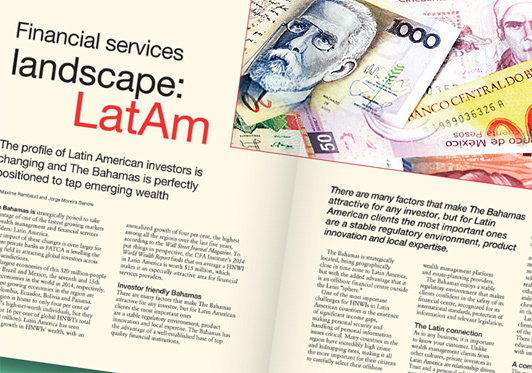 The Bahamas is strategically poised to take advantage of one of the fastest growing markets for wealth management and financial services providers: Latin America. The impact of these changes is even larger for offshore private banks as FATCA is levelling the playing field in attracting global investors across many jurisdictions. The largest economies of this 520 million-people area are Brazil and Mexico, the seventh and 15th ranked economies in the world in 2014, respectively. The fastest growing economies in the region are Peru, Colombia, Ecuador, Bolivia and Panama. The region is home to only four per cent of the world’s high-net-worth individuals, but they account for 16 per cent of global HNWI’s total wealth ($8 trillion). Latin America has seen consistent growth in HNWIs’ wealth, with an annualized growth of four per cent, the highest among all the regions over the last five years, according to the Wall Street Journal Magazine. To put things in perspective, the CFA Institute’s 2014 World Wealth Report finds that on average a HNWI in Latin America is worth $15 million, which makes it an especially attractive area for financial services providers. There are many factors that make The Bahamas attractive for any investor, but for Latin American clients the most important ones are a stable regulatory environment, product innovation and local expertise. The Bahamas has the advantage of a well-established base of top quality financial institutions. One of the most important challenges for HNWIs in Latin American countries is the existence of significant income gaps, making personal security and handling of personal information issues critical. Many countries in the region have incredibly high crime and kidnapping rates, making it all the more important for their citizens to carefully select their offshore wealth management platform and estate-planning providers. The Bahamas enjoys a stable regulatory environment that makes clients confident in the safety of its financial centre, recognized for its international standards, protection of information and relevant legislation. As in any business, it is important to know your customer. Unlike wealth management clients from other cultures, private investors in Latin America are relationship driven. Trust and a personal relationship are very important. On average, clients can easily stay with the same financial services provider for 20 years or more, once the personal component exists. Generally, they invest with a horizon of five to seven years. Typically, Latin HNWIs are predominantly self-made millionaires who amassed their money in various sectors such as telecommunications, trading, mining, real estate, farming plantations and other raw materials. As self-made individuals, the Latin American client tends to be more involved in the management of his/her assets. Latin American wealth management clientele are no longer composed only of the traditional “old money” clients. There is a new class of highly educated HNWIs who are tech savvy with international exposure. The numerous countries in Latin America make for a very competitive and complex market. Differences in culture, language and a high demand for exceptional service present real challenges in competing against local Latin American providers that are constantly evolving and improving their standards of service. Domestic financial services providers in Latin America have emerged as growing competitors. They enjoy the advantage of local knowledge and “on the ground” intelligence and very valuable networking, but often lack international experience and vision in multi-market and multi-currency environments. Competition further increases with providers in other IFCs such as the US, where a large number of professionals have the advantage of close ties to the Latin American region. Financial institutions in the US benefit from the safety brought by the jurisdiction, are very efficient and used to working with clients in their home language. The key to success in this difficult and competitive market lies in understanding the needs and behaviours of Latin Americans, as clients, and offering a different global perspective in their native language. Traditionally, Latin American clients’ portfolios were heavily invested in US assets and their offshore funds represented mainly their retirement and emergency savings. We see a trend of Latin American clientele increasing their allocations in foreign currency. Due to historical circumstances, Latin American investors are well known for seeing an opportunity in times of crisis. In many countries, Latin Americans have lived through periods of political unrest and instability, causing them to become wise investors during times of volatility, focused on the safety and protection of their investments while paradoxically looking for high yield returns. With that complexity in mind, typically, Latin American HNWIs spread their wealth and avoid “putting all their eggs in one basket” via a large diversification of financial services providers and/or financial centres. Latin American clients focus on a wide array of products ranging from high quality to emerging markets fixed income, real estate in Europe and the US and complex financial structures. The main trend is a preference in custom managed, and very well controlled, accounts and products, with an instinctive avoidance of complex, illiquid and non-transparent strategies. Their strategies, especially among the under-50 HNWIs, show an increase in popularity for the use of credit leverage for investment opportunities and structured products. The complexity of the Latin American investor looking for safety and high return at the same time requires advisors specialized in many markets, especially since there is an eagerness to invest in high yield fixed income and high yield products from Latin American countries. In general, the Latin American appetite for risk is balanced– conservative with a high proportion of fixed income in their portfolios. HNWIs in Latin America are increasingly demanding exclusive products and services that are unavailable in their domestic markets. Being more acquainted with a product based approach, clients now need financial advice and education, to move toward an advisory and asset allocation approach. In addition, they now require professional advice and flexibility regarding the new product offerings available. In this respect, The Bahamas has been very proactive in creating new financial products for a demanding Latin American clientele. This array of asset holding vehicles and services offered regarding estate planning is attractive to HNWIs. It is evident that technology plays a key role in all aspects of today’s world. The new generation of inherited wealth and self-made entrepreneurs will push financial service providers in The Bahamas to adopt new ways to tailor their services, to a more technologically sophisticated client base. It is likely that Brazil and Mexico will continue to lead the region’s growth in the long run. As a result, this environment will bring an increase in wealth among traditional families and the continuity of the emergence of a new generation of wealth from top executives and entrepreneurs, who have been benefiting from the region’s thriving economies over the past decade. The Bahamas, as a reputable financial centre keeping up with world regulatory standards and with adequate vehicles perfectly adapted and operational, will have a key role to play in a very competitive environment for the sought after Latin American clients. Clients can count on the long tradition of service in the financial industry in The Bahamas, ongoing education for local professionals and most importantly upcoming future professionals, and an improving technology infrastructure. The Bahamas is therefore creating the conditions necessary to develop new careers and opportunities for Bahamians in this changing and competitive financial industry. These key elements will be essential to successfully do business with the demanding Latin American clients and position The Bahamas as a leading financial centre for Latin America.